Now, granted, you’re not stuck in bankruptcy. You’re making money. But you thought that by now your company would be one of the ones that broke through. You’ve worked hard, you’ve put in the time, and when you started, you were practically fighting off the customers with a stick. Sure, you knew that the initial burst wasn’t something you could expect to go on forever, but you thought you could sustain your growth beyond that first surge. And now you’re getting worried. What’s happening? Why can’t you get past this point? Especially when you look around and see some of your competitors — who don’t offer the same level of customer service, who have an inferior product, who objectively aren’t putting in the work you are — and they’re breaking through. They’re racking up the users or raking in the profits. Why? What is it that they know that you don’t? Why is it that they can sustain growth over time and you feel like you’re scrambling? What’s the secret to sustainable growth? Here’s the thing about sustainable growth: it doesn’t look like what you think it should look like. In your mind, you’re envisioning that illustrious hockey stick of growth, where new customers are onboarded almost faster than you can handle, and revenues flow freely and fill your coffers. With the exception of a tiny, minuscule percentage of companies that have precisely the right combination of luck, timing, connections, and luck (again), hockey stick growth is not sustainable over the long term. But that doesn’t mean that the rest of us can’t enjoy real, sustainable growth. Rather, it means that we need to stop viewing the hockey stick as the model to which we aspire. It’s hard to look past the upswing when you look at a growth chart — but when you do, the whole picture changes. Forget about the hockey stick you’ve been dreaming of. Real, sustainable growth follows an S-curve. That’s a mathematical term used to describe a sigmoid — or S-shaped — curve. The S shape represents growth over time —it starts out slowly, then picks up speed for rapid growth. But unlike the fabled hockey stick, the S-curve then tapers off as growth slows. That’s an important point because exponential growth — the hockey stick — simply can’t continue forever. Remember the early dot-com companies of the mid to late 90s? Hockey sticks, all the way — right up to the moment they crashed and burned. When you learn to identify what sustainable growth really looks like, then you know you don’t have to panic when growth tapers off. Instead, you can recognize that you have reached a significant point on the growth curve — specifically, a strategic inflection point. All companies that experience growth will also encounter strategic inflection points — times when growth tapers off, and when the company must take action. To continue moving forward, a fundamental shift is necessary — perhaps launching a new product, making significant improvements to your existing offers, or inventing something else entirely new. In other words, what happens at that strategic inflection point depends entirely on how the company responds when it reaches that point. 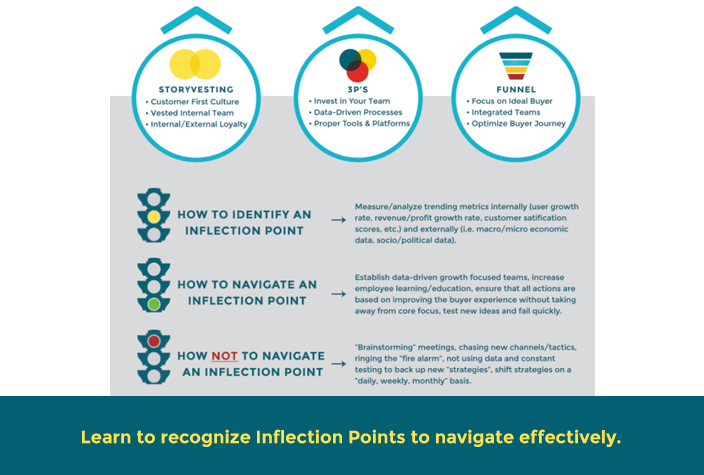 What, exactly, do you need to know when you approach a strategic inflection point? You need a deep understanding of the guidelines successful companies follow for sustainable growth. Product/market fit: You are selling something people want to buy. StoryVesting: Internal alignment that starts with employees — and partners — who genuinely believe in the product and care about creating an amazing customer experience. The 3Ps: People (employees and partners) with a growth mindset, processes that have been refined and optimized, and platforms that enable you to deliver the best possible customer experience. Modern Marketing Funnel: The path your ideal customer follows to become a buyer, continually optimized based on the data-driven insights and information you gain as you work to improve the total customer experience. When you have these in place, you have the foundation you need to drive sustainable growth. Every business — or at least, every growth business — encounters strategic inflection points along the path. Remember, this is when the company must make a fundamental shift in order to maintain forward motion and continue on the path of growth. You know you’re at a strategic inflection point when growth stops — or even reverses. That can be a terrifying moment in the life of an entrepreneur or the life cycle of a company. But if you recognize the inflection point for what it is, you can navigate it successfully. As much as I could end the post right now with a step-by-step roadmap for you to follow to get out of these strategic inflection points, I can’t. Unfortunately, there’s no single map you can use to navigate every inflection point successfully. But rest assured that you will need to adapt and innovate each time you reach such a point. What does that look like? It varies. In some cases, navigating an inflection point means innovating a change in your product to realign your offering with your target market. For example, this type of innovation happened when Netflix stopped mailing out DVDs and started delivering content via the Internet instead. Other times, you may need to make improvements to the processes within your marketing funnel. 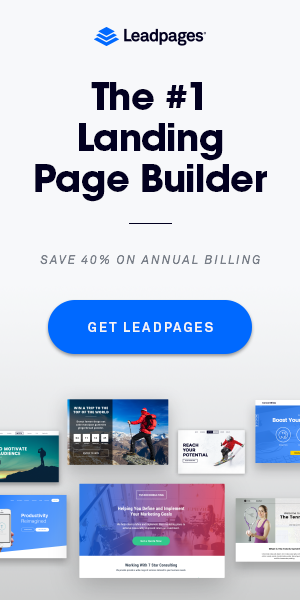 For example, many companies have started using popular platforms as logins instead of requiring customers to go through a lengthy signup process to improve the onboarding experience. Or again, you might need to invent something entirely new to meet the needs of your ideal customer, such as InfraGauge did to improve safety measures in the dangerous field of drilling for oil. Regardless of the size of your company, if it is built on the foundation of the growth framework, and if your people are grounded in a growth mindset and have access to the right training and education, you should be able to navigate these inflection points successfully. Approach each one as an opportunity to transform your company into a competitive digital leader — by creating a customer-centric culture and encouraging collaboration between your various teams (marketing, technology, product development, sales, etc. ), you will find ways to create the economies of scale that lead to sustainable growth. Every inflection point is an opportunity to transform your company into a digital leader. When revenues stall, it’s easy to panic — or to chase after something, anything, that will get some cash in the door. But if you give into that panic, you’re playing the short term game. You’re racing after New! Improved! Tactics or Channels. This type of shiny object syndrome won’t do as much as you might think it will to achieve sustainable growth. Sustainable growth is about the long term. 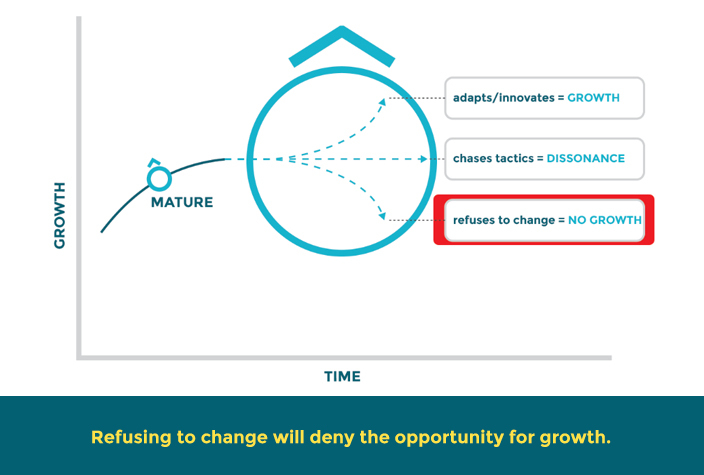 It’s not about the short-term revenue blips that most companies can successfully engineer through chasing after the next big thing. Now don’t get me wrong. I’m a big believer in new channels and new tactics when they are used in connection with an overall strategy that accounts for the difference between strategy and tactics, the way Lee Odden explains. 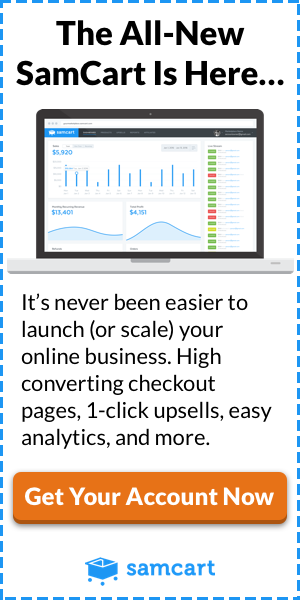 For example, if you were one of the first people on Pinterest, you probably saw a nice revenue spike, maybe even a large one which gave you the major traction you needed to launch into more sustained growth. But once everyone else was on Pinterest, too, you likely saw that growth taper off. And then what? Many companies began frantically searching around for the next Pinterest and raced to get themselves set up there. And maybe they managed to ride the next wave for another revenue blip. Maybe, when viewed close up, that blip even looked like a hockey stick, driving revenues and users ever upwards. Here’s the thing about channel and tactic chasing that you can’t always see when you’re in the middle of that upward swing: when you spend all your time chasing after the next big thing, you can never be the one who innovates the next big thing. You don’t have the time to make the small improvements that over time help sustain momentum. You’re not innovating new strategies to refine your processes or inventing new products. And when you chase tactics without a strategic plan in place, you will eventually hit a wall. 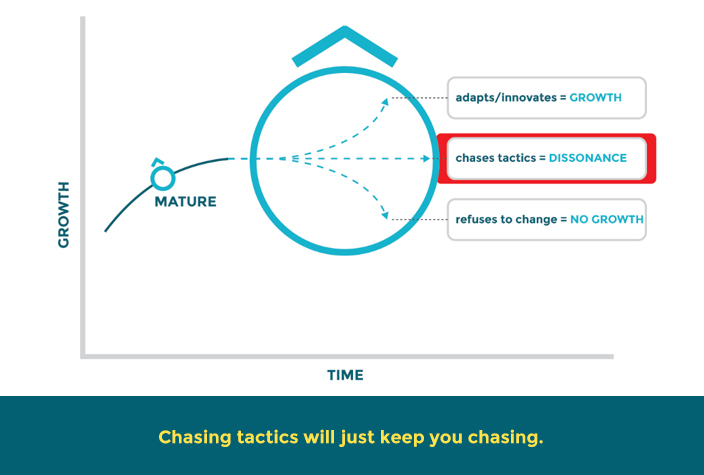 Channel chasing, more often than not, is a short-term strategy that cannot sustain growth over the long term. 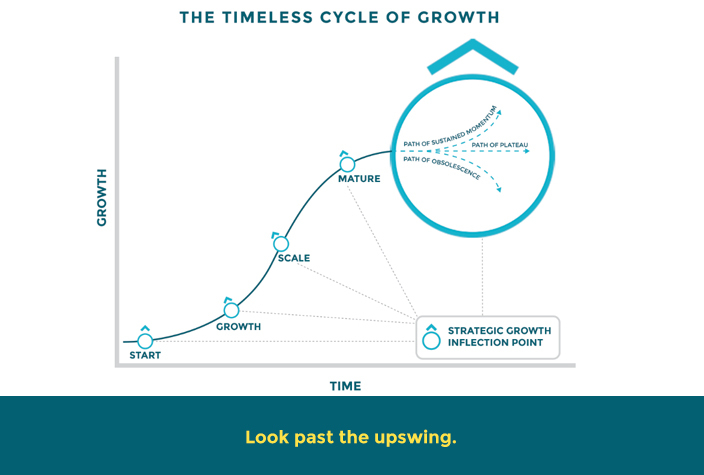 Sustainable growth comes from the little wins that add up to a major plan — a strategy — over time. The regular, iterative improvements to your product, the innovations that move you forward, and the inventions that propel you ahead of the competition. So if you plunged into Pinterest and saw growth, instead of chasing after the next channel, STOP, and take a closer look at the growth you gained from Pinterest. You can then strategically leverage your Pinterest growth effectively by engaging users, finding out what they want, and tweaking your product offering accordingly. Think about how you can turn your Pinterest followers into brand ambassadors, use them to attract a new wave of users, and reduce overall churn. Let’s say you’ve just discovered the magic of Pinterest now. Does it make sense for you to jump in and start pinning? Maybe — but before you jump in, why not consult an outsourced Pinterest expert, like Anna Bennett, to determine whether this is actually a viable and sustainable growth strategy for your brand. Now, instead of simply chasing after a channel or tactic, you’re thinking strategically and building a tactical plan based on your strategy. That’s how you build sustainable growth. Sustainable growth comes from the small wins that add up to a strategy over time. Sometimes a revenue stall is related to external factors. The product/market fit for your locally-based semi-luxury product was absolutely perfect a month ago, but last week the major employer in your city laid off 900 workers, and the local economy has tanked. Do you slash your prices? Expand into new markets, where the landscape is brighter? Revamp your offering to be more closely aligned with current consumer needs? Rebrand your company as a luxury solution and target only the wealthy? Here’s what you don’t do: You don’t ignore the evidence in front of you. You don’t refuse to see what’s happening in the world as having an impact on your business. You don’t willfully block out external factors and plunge ahead as if nothing has changed. How you respond to external factors depends, of course, on what exactly those factors are. What’s critical and constant, however, is that you follow Margaret Heffernan’s advice on decision making and act strategically, based on the knowledge that you are facing an inflection point. When the threat to sustainable growth comes from within your company, it can sometimes be extremely difficult to identify. If you’ve been part of a culture that’s working hard to maintain the status quo, it’s not easy to recognize when you’re stuck in a rut. And upsetting that status quo can be terrifying — particularly if the business is generally running smoothly and there’s no real push to change — other than the desire for growth. In this situation, you need buy-in before you can enact change. You cannot simply issue a mandate and expect everyone in the company to suddenly be on board because you said so. Instead, you will need to put in time and team training to help your employees understand the underlying need for the change, and give them the skillsets they will need to be an active part of the change. You may discover that some of your employees simply cannot get on board — and at that point, you’ll have some tough decisions to make. Bear in mind that employees who are not growth-minded will not be able to contribute effectively, and may even actively work to disrupt change. 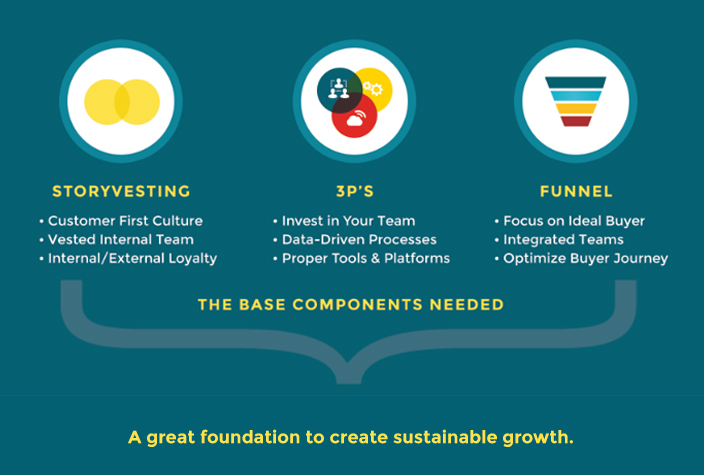 It is critical to ensure that you have the base components — the growth framework — as your foundation. 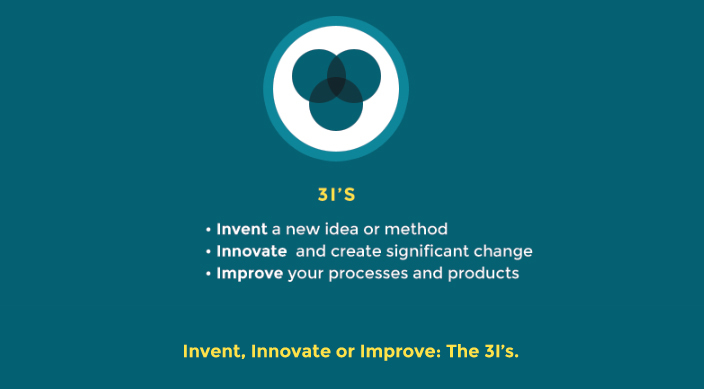 Only then can you effectively use the 3Is — innovation, invention, and improvement — to sustain your forward momentum when you reach a strategic inflection point. When you want to improve growth and retain the customers you already have, you must ensure that your entire marketing funnel — from attracting potential customers through onboarding and all the way through turning customers into advocates — is frictionless. In fact, Christoph Janz even recommends hiding any complexities that might be involved until the user is more comfortable and committed to the product. The customer experience — the entire customer experience — must be nothing short of sublime. Remember how it felt the first time you picked up an iPhone and you knew exactly what to do because there was only one button? You want your user to feel that way all the time. He should never have to stop and think, “Hang on, where’s that thing I wanted to click?” Hide the complexities. The iPhone has them, but they’re definitely not the first thing you see. Frictionless onboarding is for everyone — not just SaaS companies. When you figure out which employees are committed to the idea of growth, which employees can embrace the growth mindset and bring the innovation, invention, and improvement needed for sustainable growth, you need to do everything in your power to keep those employees on board. Obviously, this starts with paying your employees what they’re worth, but it doesn’t end there. You also need to make sure your employees understand the company’s overall growth plan — and how their daily tasks fit into that plan. Don’t just tell your web designer that the entire site needs to be redone. Explain why, and show him how his contribution directly affects the bottom line. At the end of the day, as Kathryn Minshew succinctly points out, employees care a lot about their relationships at work. A smart customer retention strategy ensures that your offering is orders of magnitude better than the competition’s so that your customers never even consider leaving. Apply the same strategy to your employees: offer them training that appeals to their personal and professional growth curves while making them more valuable to the company. Demonstrate a path of success with increasing responsibilities — and commensurate compensation packages — over time. Survey your employees — just as you survey your customers — to find out what they really want, and give it to them. When Apple burst onto the scene in 1984 with the original Macintosh, it was with an invention that completely changed the way people thought about computers. And for a time, the company reveled in growth that you might easily have mistaken for hockey stick growth. And then that growth tapered off, and the company began the first of what would be many downward spirals. That story, of course, ultimately has a happy ending—at least for now. Like a phoenix rising from the ashes, Apple came back, again and again to create multiple billion dollar business units. The iPod wasn’t the first portable MP3 player on the scene — but the invention of the scroll wheel coupled with the iTunes software completely transformed the way we listened to and purchased digital music. The later innovation of the iPod touch and the iPhone paved the way for the App Store — which paved the way for an entire new industry of app developers. Not content to rest on their laurels, Apple continued to make iterative improvements to iTunes, based on user feedback, and ultimately created a sophisticated multimedia content manager, ecommerce platform, and hardware synchronization manager. Luck? Once, okay. Twice, maybe. But beyond that, something else is clearly happening. Apple as a company reaches strategic inflection points and responds accordingly. Is every innovation a winner? Of course not. Is every invention the iPhone? No. But because Apple responds to strategic inflection points by inventing and innovating, by improving its existing products — and its people and processes when necessary — the company successfully navigates these points along the S-curve of growth. If you zoom in on any period of time, you might think you’re seeing hockey stick growth — or a death spiral. But when you step back, you realize that you are looking at the S-curve of growth on a large scale. 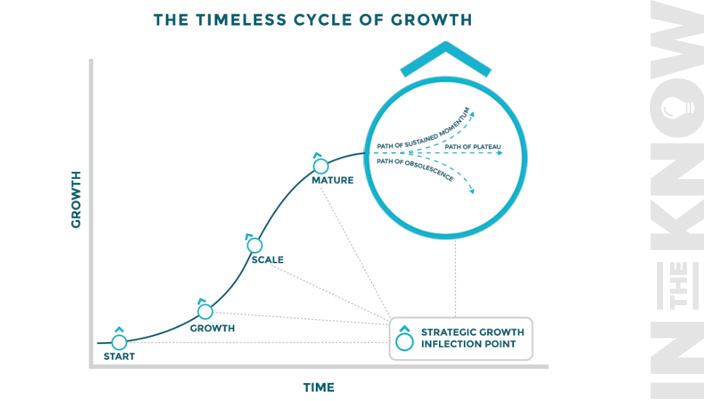 Growth that the company can sustain over time, because it approaches these inflection points and adapts accordingly. In 2004, video rental chain Blockbuster employed over 60,000 workers across 9000 stores. Not only did Blockbuster dominate the video rental market, it actually wasn’t interested in buying the tiny upstart Netflix — which seemed headed for dot.com destruction. But then came a pivotal moment. A strategic inflection point. Increased broadband speeds made streaming media possible. The home delivery model was gaining traction. Netflix adapted — and Blockbuster refused to change. Can every company see sustainable growth in perpetuity? Probably not — but the economists can debate that. Most companies, no matter their size, can transform into digital leaders by starting from the foundation of the growth framework and supplementing that with the right training and education for employees and partners. Sustainable growth stems from a customer-centric, collaborative mindset that touches every part of the business. 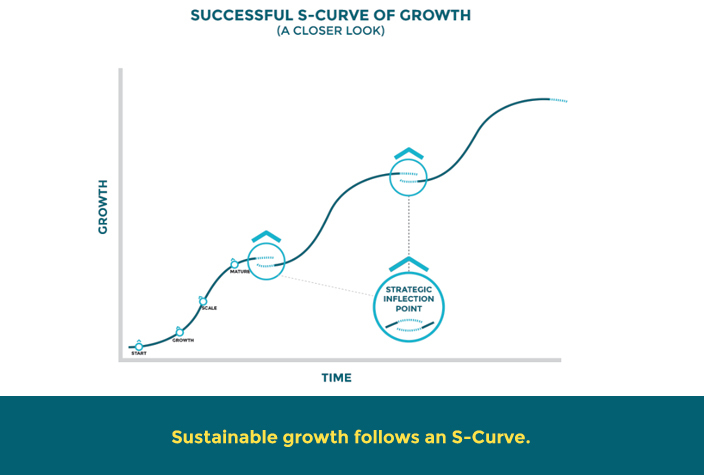 As long as you continue to encourage innovation on a company-wide scale and to challenge the status quo at every inflection point, you can navigate the S-curve successfully to long-term, sustainable growth. Understanding what sustainable growth looks like is the first step. 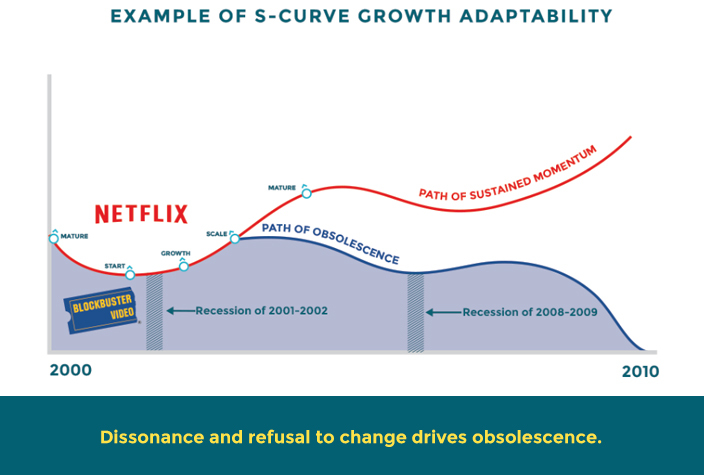 Once you see the image of the S-curve of growth and how strategic inflection points affect growth, you’re better equipped to confront the natural pattern of growth. You can prepare psychologically for the time when growth stalls, and you can more objectively navigate each strategic inflection point. Regardless of your industry, putting in the time to uncover and fix your growth roadblocks is always the best place to start. Once you know what’s in your way, you can then figure out the best levers to pull to drive sustainable growth. 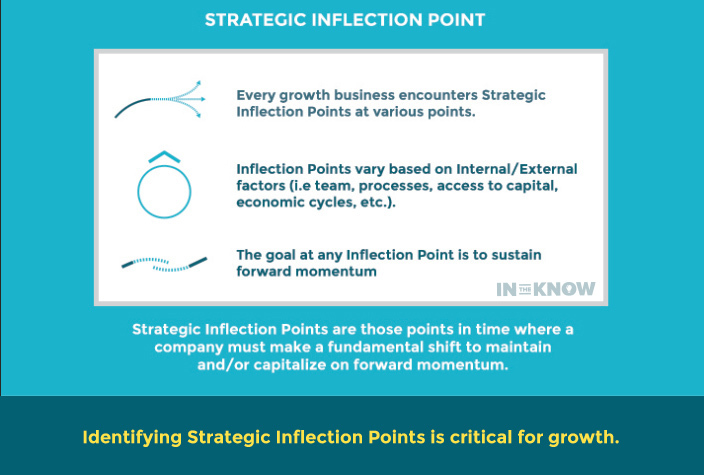 Are you currently facing a strategic inflection point? Do you need help to navigate effectively? Contact In The Know to see how we can help. Copy and paste the text in the box below to share this image on your site. Please include attribution to BeInTheKnow.co with this graphic. Agreed as a business owner we need to constantly evaluate our growth cycle. Everyone likes to grow!! Your 7 guidelines will surely help us to keep our web development firm to be on track. Thanks!!! Thanks. Glad to hear that it’s resonating. I’m open to guest writers so shoot me a message on our contact us page.